Chief Dr. Emelike Godwill Okoro is an agronomist, accomplished author and an erudite scholar. He attended Government College Afikpo for his secondary education before proceeding to the University of Nigeria Nsukka where he attained his Bachelors of Science degree with honors in Agronomy and Soil Science. Afterwards, he acquired his Masters degrees and PhD in Agribusiness and Soil Science from Prairie View A&M University in the United States and University of Manitoba in Canada respectively. Dr. Okoro has always had a penchant in researching and delivering methods to aid in provisions for all people of Nigeria, which led him into a successful career in agriculture and environmental research and service. He also has been the head and Dean of the College of Agriculture in Owerri from 1982 to 1985. From there, Dr. Okoro had a successful run as the Programme Manager of Imo/Abia’s Agricultural Development Program (ADP). He wanted to do more for Nigerians at large, so he embarked in a more research intense consulting role with the International Institute of Tropical Agriculture (IITA), which is headquartered in Ibadan. Member, Board of Directors of Abia Rubber Company Limited. He was the recipient of several awards and grants and to name a few are, Distinguished Alumnus Award of the University of Nigeria, Nsukka; Ph.D. Research Fellowship Award – IDRC Canada 1977-1981; Science Travel Grant of the American Association for the Advancement of Science 1976 and 1978 and a Fellowship by Institute of Corporate Administration of Nigeria. He continued his education successfully completing courses in Management of Agricultural Research – OICD/USDA in 1992, Environmental Management Course for Managers of Environmental Protection Agencies and USDA Study Tour on Agribusiness in Washington DC from February to March 1996. Okoro played a pivotal role in the cassava crop revolution in Nigeria under the Obasanjo era. He worked at Onne in Rivers State as the team co-ordinator of the Cassava Mosaic Disease Project (CMD). Later, the Project blossomed into the ICP led by Dr. Alfred Dixon at the IITA and Dr. Okoro served as the Project National Coordinator based in Onne. The two men authored multitudes of masterly research documents for the progress of cassava work worldwide. 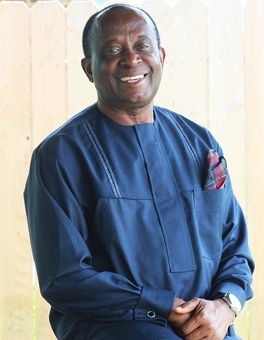 In recognition of his invaluable contributions to the promotion and sustenance of the community at large and his vast knowledge of the land, State and political landscape, Dr. Okoro was elected to the Abia State Elder’s Council, the highest advisory body to the State Governor, where he currently serves as the Secretary General. With his selfless commitment to the development of Abia State, in June 2015 Dr. Okoro was appointed Secretary to the Abia State Government, the position he holds till date. He is married to Lolo Joy Uchechi Okoro, an accomplished managerial level nurse and their union is blessed with five children.